Healthy Homes recently featured us in their magazine. The article touched on a number of topics including our history, how we stand out versus our competitors and also what we are seeing as popular items going into 2019. 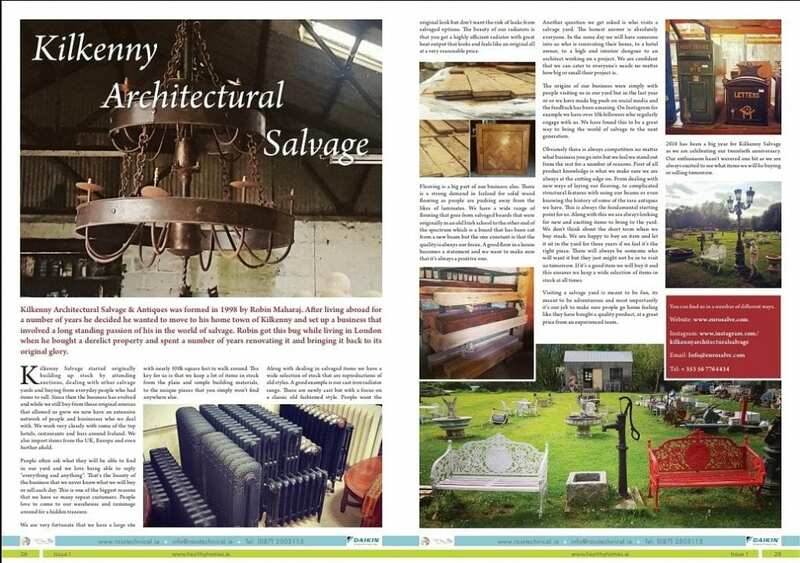 Kilkenny Architectural Salvage & Antiques was formed in 1998 by Robin Maharaj. After living abroad for a number of years he decided he wanted to move to his home town of Kilkenny and set up a business that involved a long standing passion of his in the world of salvage. Robin got this bug while living in London when he bought a derelict property and spent a number of years renovating it and bringing it back to its original glory. Kilkenny Salvage started originally building up stock by attending auctions, dealing with other salvage yards and buying from everyday people who had items to sell. Since then the business has evolved and while we still buy from those original sources that allowed us grow we now have an extensive network of people and businesses who we deal with. We work very closely with some of the top hotels, restaurants and bars around Ireland. We also import items from the UK, Europe and even further afield. People often ask what they will be able to find in our yard and we love being able to reply “everything and anything”. That’s the beauty of the business that we never know what we will buy or sell each day. This is one of the biggest reasons that we have so many repeat customers. People love to come to our warehouse and rummage around for a hidden treasure. We are very fortunate that we have a large site with nearly 100k square feet to walk around. The key for us is that we keep a lot of items in stock from the plain and simple building materials, to the unique pieces that you simply won’t find anywhere else. Along with dealing in salvaged items we have a wide selection of stock that are reproductions of old styles. A good example is our cast iron radiator range. These are newly cast but with a focus on a classic old fashioned style. People want the original look but don’t want the risk of leaks from salvaged options. The beauty of our radiators is that you get a highly efficient radiator with great heat output that looks and feels like an original all at a very reasonable price. Flooring is a big part of our business also. There is a strong demand in Ireland for solid wood flooring as people are pushing away from the likes of laminates. We have a wide range of flooring that goes from salvaged boards that were originally in an old Irish school to the other end of the spectrum which is a board that has been cut from a new beam but the one constant is that the quality is always our focus. A good floor in a house becomes a statement and we want to make sure that it’s always a positive one. Another question we get asked is who visits a salvage yard. The honest answer is absolutely everyone. In the same day we will have someone into us who is renovating their home, to a hotel owner, to a high end interior designer to an architect working on a project. We are confident that we can cater to everyone’s needs no matter how big or small their project is. The origins of our business were simply with people visiting us in our yard but in the last year or so we have made big push on social media and the feedback has been amazing. On Instagram for example we have over 10k followers who regularly engage with us. We have found this to be a great way to bring the world of salvage to the next generation. Obviously there is always competition no matter what business you go into but we feel we stand out from the rest for a number of reasons. First of all product knowledge is what we make sure we are always at the cutting edge on. From dealing with new ways of laying our flooring, to complicated structural features with using our beams or even knowing the history of some of the rare antiques we have. This is always the fundamental starting point for us. Along with this we are always looking for new and exciting items to bring to the yard. We don’t think about the short term when we buy stock. We are happy to buy an item and let it sit in the yard for three years if we feel it’s the right piece. There will always be someone who will want it but they just might not be in to visit us tomorrow. If it’s a good item we will buy it and this ensures we keep a wide selection of items in stock at all times. Visiting a salvage yard is meant to be fun, its meant to be adventurous and most importantly it’s our job to make sure people go home feeling like they have bought a quality product, at a great price from an experienced team. 2018 has been a big year for Kilkenny Salvage as we are celebrating our twentieth anniversary. Our enthusiasm hasn’t wavered one bit as we are always excited to see what items we will be buying or selling tomorrow.